The present Jagannath temple is a rekha deula with curvilinear tower on a Pancha Ratha plan (Five chariot plan). It was built by Ananta Barma Chodaganga Dev during 12th century A.D and was completed by his grandson Ananga Bhima Dev. This temple is one of the tallest monuments in the country, with a height of about 214 feet from the ground level. The Annual Rathayatra festival is the high point of all the Festivals celebrated. Millions of devotees from every corner of the world gather round the temple during the 'Ratha Yatra' festival of Sri Jagannath. As the legend goes, every year Lord Jagannath, accompanied by His brother Balabhadra and sister Subhadra leaves the temple to visit His aunt. The three of them are pulled in huge stringed chariots (Rathas) and the King of Puri himself sweeps the roads with a golden broom for the Lord of the World to pass. It is believed that observing the Ratha Yatra and pulling at the ropes of the chariot leads one to salvation from the cycle of birth and date. The ethnic art of Patachitra germinated from a ritual observedin the Jagannath temple of Puri, Orissa, a state in Eastern India. Patachitras are handmade paintings executed on treated pieces of cloth or impressed on stitched palm leaves (Talapatachitra). The most frequently depicted theme involves the holy Triad of the Jagannath Temple � Lord Jagannath, Balabhadra and Subhadra. This particular Talapatachitra follows tradition in depicting the Jagannath Temple Deities in �bada-singhara vesha�. During the various ritualistic activities in the temple, Lord Jagannath and his siblings are dressed in various costumes and jewelries (�Veshas�). The most elaborate of them all is the �bada-singhara vesha� � an attire given to the deities before they are put to bed. In this dress, the three deities wear silk cloths on which the text of the Gita Govinda (a poem cycle by the medieval poet Jayadeva that celebrates the love of Krishna and Radha) is written. They are also garlanded with flowers. This is the vesha most commonly depicted by the chitrakaras. In this painting, Balabhadra is shown with a white face, oval-shaped eyes, stump arms just below eye level, and a snake's head on top of his own head. Balabhadra, according to legends, is identified with Lord Krishna�s sibling Balarama, who himself is identified with the snake god Ananta; hence the iconography of the snake's head. Subhadra is carved with a yellow face, oval-shaped eyes, and she has no arms. Jagannath has a black face, prominent round eyes, and stump arms just below eye level. The characteristic details of lines and colors can be observed in this Talapatachitra. Earthen colors of red, green, yellow and white have been used within a leafy fringe.Sri Jagannath (Lord of the World) is an 'Avatar' or incarnation of Lord Vishnu,the second in the Holy Hindu Trinity of Gods (Brahma, Vishnu and Maheshwar). The Jagannath Temple in Puri, Orissa, is dedicated to Him. It is one of the four Holy 'Dhamas' (holy seats) of India including temples at Rameshwaram, Dwaraka, and Badrinath. The Jagannath idol is black in color and lacks proper arms. 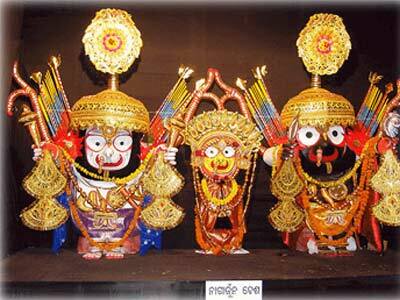 He is worshipped along with His brother Balabhadra and sister Suvadra.